I didn't want to make a full on layer cake, because its just a bit too much work for a Sunday morning. And I always feel a bit guilty slicing into a whole cake as my nighttime snack....shhhh. So A sheet cake was the way to go. It feels more like a snack cake and much easier to decorate. I came upon this recipe from Handle the Heat and it seemed perfect. It's a simple, one bowl recipe. Perfect to whip up at 9am on a Sunday morning. Ha! Tis, the life of a blogging mom. The warm spices of this cake really permeate the air of your house as this bakes, making you crave a slice before it even comes out of the oven. After waiting...patiently for this cake to cool... I frosted it with an orange tinged cream cheese frosting. Because I can't imagine touching a carrot cake with anything less than a cream cheese frosting. And because I really, what doesn't go well with a cream cheese frosting? So there it goes, a gorgeous layer of cream cheese frosting. Then the fun part. The eyes. 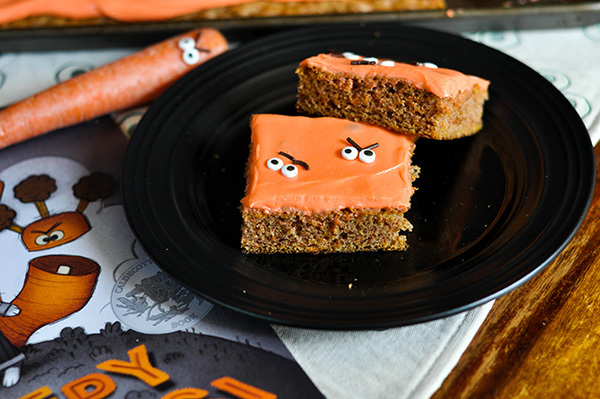 In the book, the carrots all have eyes, angry eyebrows and mouths. So I wanted this cake to look like these creepy carrots were looking angrily out at you after you cooked them up into a cake. I used candy eyes and chocolate sprinkles to make the angry eyes . The kids really loved this and it wasn't too scary gory. Light Halloween fun for the little little ones! In a large mixing bowl, mix the sugar and oil together. Add the dry ingredients and mix until combined. Add in buttermilk and mix. Fold in the carrots and then spread into the greased pan. Bake for 24 to 26 minutes or until toothpick comes out clean.